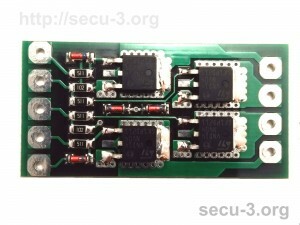 4-channel Hi-Z injector driver (set for DIY assembling). 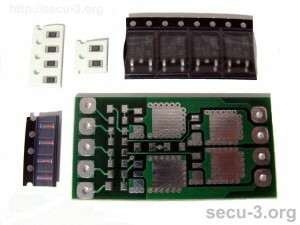 It is also possible to order assembled board. This driver board intended for use in conjunction with SECU-3T units, but it can be also used for other purposes (with other ECUs and not only for injectors). At the inputs of two channels optional pull-up resistors to GND provided, which gives opportunity to drive mentioned inputs from high-side ECU outputs (for instance, SECU-3T has 2 high-side outputs). On the bottom of the board there are four mounting places for TSV diodes. Which can be used for output voltage clamping. Thus, if necessary it is possible to use cheap FET transistor instead of relatively expensive OMNIFET. Designs for assembling please see in the Documentation.